Dune-building in front of Fire Island’s eastern communities could begin early next year, an official estimated Saturday. The $207 million dune, designed and fully funded by the Army Corps of Engineers, is about two years behind schedule due to storms, overbooked dredgers, and the complicated process of acquiring the land needed. The federal agency, which unveiled the plan in 2013, expected to finish defending about one-third of the barrier island from storms with dunes as high as 15 feet by 2016. Because the Fire Island National Seashore encompasses the island, the National Park Service had to approve the plan, as did New York State. 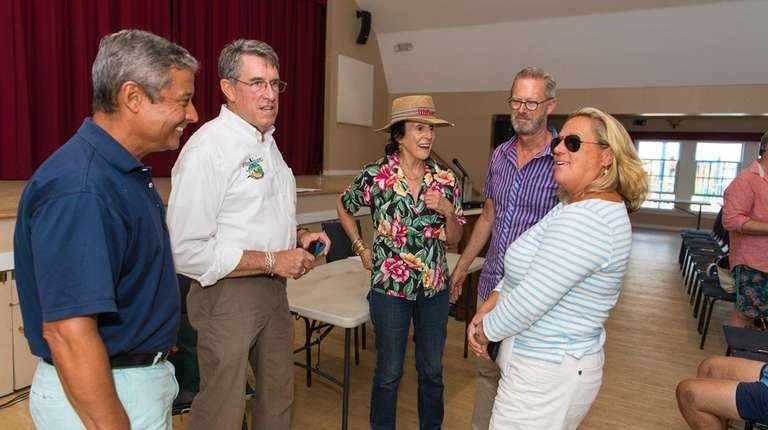 Fire Island National Seashore Superintendent Chris Soller, addressing a Fire Island Association annual meeting in Ocean Beach on Saturday, said much of the work was done. Very little is left on the “punch list” for the section from Democrat Point in the west to Seaview in the east, he said. To the west, “the beach, in my opinion, has never looked so good,” he said. In the east, however, nearly two dozen homeowners who were bought out could have enjoyed another summer in Ocean Bay Park. Instead, their oceanfront homes, slated to be torn down to make way for a new dune, were boarded up last spring. Now plans call for the wrecking crews to begin by January 2018, Soller said. In addition to the Ocean Bay Park demolitions, about 13 beachfront homes in Davis Park will be moved or realigned; about a dozen pools and decks in the Pines will be relocated. Some of those projects might spill over into a dune-building contract, which in early 2018 should see work starting in those communities, as well as in Point O’ Woods, Cherry Grove, and Water Island, he said. Soller noted that these schedules might be modified. However, dune-building next year could continue through the summer, instead of halting to shield endangered piping plovers who are nesting. “It’s not going to break for the summer; that’s the goal,” Soller said. Recently, the tiny shorebirds have favored Jones Beach State Park and the area by the breach that was cut by superstorm Sandy in 2012. The breach currently appears to be closing on its own, Soller said, as sand is accumulating. “How soon it will close is anybody’s guess,” he said, as future storms might open it wider or close it. Scientists have found it has not heightened flooding but has improved water quality around it, Soller said. Fire Island’s growing deer herds have proved controversial, with some calling for culling to protect Sunken Forest, for example, and some wanting them protected. The earliest any culling, which would be carried out by Department of Agriculture hunters, could begin is 2019, he said. If New York State follows the lead of the federal government by approving a contraceptive, that option might be considered, he said.